There is a lot to be said for retrospective observations. They can often reveal forgotten perspectives and revive enthusiasm in things passed. Reminiscing is all well and good when sat around a pub table with some old mates from way back but when it comes to serious race equipment it can often mean reviving a previous race winner that got put on the back shelf to make way for inferior shelf queens. In my case, the Pro Slot Porsche GT2 and its stable mates are probably part of the forgotten glory. 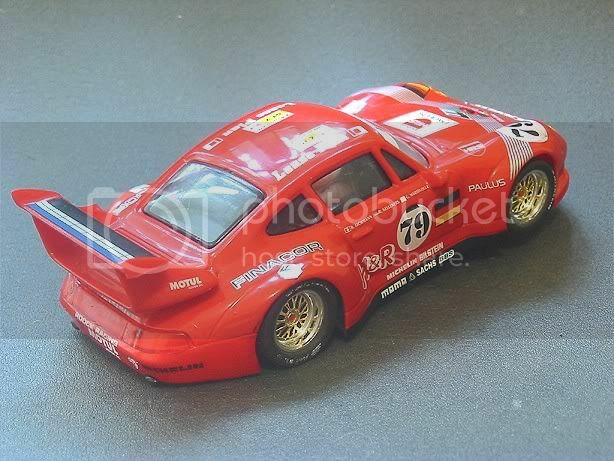 But for a small period going back several years they ventured into the 1/32 hardbody arena and not without shame either. I’m not really sure why their stay was so short but for the brief period they were there they left their mark on racers like myself. It has to be said that their ideas of a 1/32 slot car were very similar to the basic plan already tried and tested in 1/32 and 1/24. the chassis were dead flat featureless mouldings which carried only the basic motor and axle mounts and magnet holders. The novelty was the way the motor and rear axle were mounted into a cradle which pivoted around the axle bushes. The front end was held in check by a moulded rubber piece which allowed nominal up and down movement. This, at first, seemed a good idea but soon proved to be a source of ‘tramp’ on painted wood surfaces. This model shows the front end and axle mount areas of the cradle epoxied in place. You can be forgiven for thinking that at first glance you are looking at a Fly chassis circa 2000 as it is a very good likeness. The front wheels and tyres revolve on independent stub axles as Fly do but I must confess they are much more restrained than the Fly axles and do not wobble half as badly. The front wheels also barely touch the track surface on a board track and on plastic track with raised metal rails they don’t touch at all. The guide is a dead ringer for the Fly, Scalex guides of that era but they are a more snug fit with minimum side and front to back slop. There is a rubberised type fridge magnet in a bracket about ten mm behind the front axle. This contributes very little to its handling on a plastic track and you could swear there wasn’t a magnet there at all! 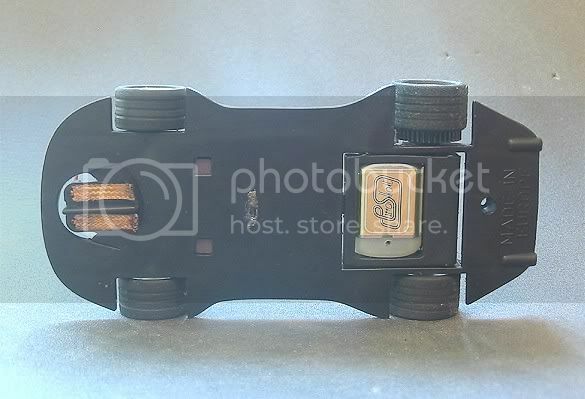 Pro Slot were very heavily into spares for their cars and one of the spares was a dead weight that could be fitted into the magnet position for board racing. 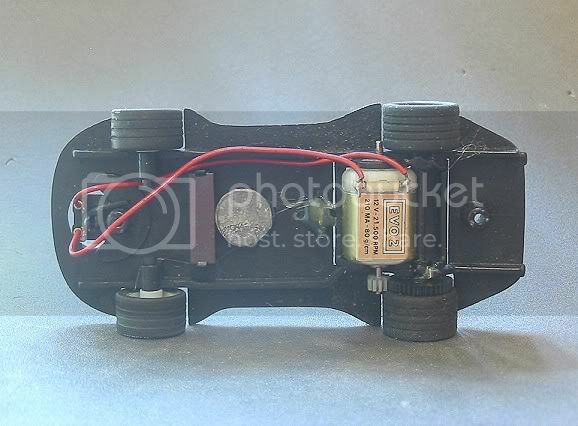 On this model I have hot glued a round plug of lead behind it which balanced the car very nicely. The motor is the notorious ProSlot Evo 2! This is a Mabuchi ‘S’ can rated at 21,500 rpm at 12 Volts. That would give it a speed of around 24,000 rpm at 13.8/14.2 volts. I say notorious as it was the practice of some unscrupulous racers to peel the gold sticker off this motor and place it in lesser models for competition. Fortunately, it is a can end drive which restricted its use. The main complaint with this set up was the failure rate of the pinion. Unlike the later Scalextric reinforced pinions, this was a straight through cut and it left the pinions weakest point as the depth of plastic in the tooth valleys (Not a lot!) All of mine are still intact but I would attribute this more to ensuring there has not been any foreign particles left in the mesh before running. I have replaced the pinions on several other models with the Fly 11z brass pinion. The wheels are superb, I love wheels, one day I am going to make a huge BBS style wheel and race it on its own! Again similar to Fly cars of the day these are anodised in gold and silver chrome and they have a very sturdy axle boss to ensure their longevity. Both front and rear hubs are very true. Moulding and sprue flash are almost non existent and the tyres need little treatment to true them up. Indeed, straight out of the box, this car was a flyer on board and it was painfully obvious that it was going to be a threat. 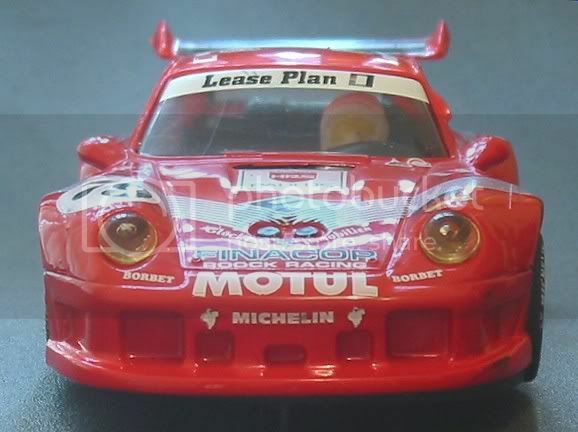 The car depicts the German Roock Racing prepared Porsche 911 GT2 which contested European GT classes and Le Mans. 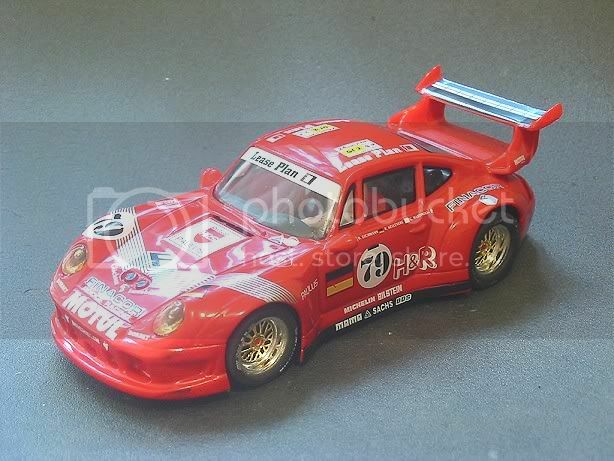 The body is a good likeness and compares favourably in scale to most other model 911 GT2’s. 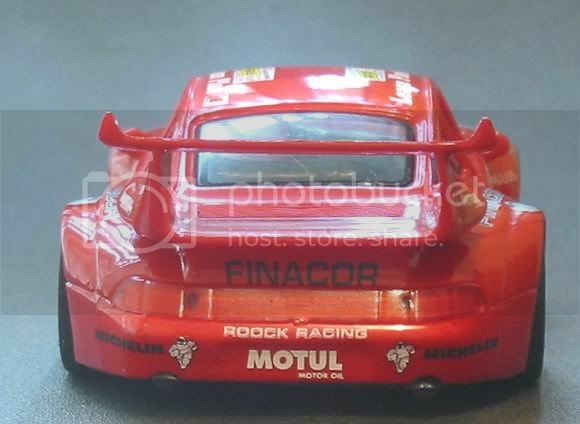 It sits unbelievably close to the ground by comparison but Pro Slot continued the Ninco trend of over exaggerating the width of these models for the sake of real track performance. The tampo is fair to good with some slight deviances in alignment but Pro Slot have gone to the lengths of depicting small detail even down to the side and rear window seals and trims. The interior is sparse but does include a full length driver even if he is suspended in mid air! But HEEY! This is a RACING car, not a shelf queen! There is also a token dash board and engine cover to complete the interior. The one feature I admire the most is the body mounts. Just one front and rear! This to me is the current ideal set up as it allows the body an unrestricted rolling motion when it has been race tuned. Backing off these screws a turn allows the body to rock moderately from side to side and we all should know by now the contribution this makes to overall handling. So this car was built for racing and race it does! Moving on to my retro track test, I took it along with my other favourite to friend Garry’s track and dusted the old girl off for the event. How short a memory do people have (well, me anyway). Out of the box, on to the track, WHOOSH! WHOOOAH, CRASH!! @#*#@ F***ING J***S !!! I’d forgotten how well it went even on a 45 ohm controller! Reslotting the car I notched it back a couple and ran at a moderate superfast pace. The motor is a ball of fire, I’d sometime previously, placed a lead disc forward of centre obviously to balance this car nicely. Without it, it would lift the front wheels and head off into the landscaping and I found it hard to win anything under those conditions. With the weight added it reduces the lift to the odd hop! The Pro Slot tyres are also legendary and for a while were the standard replacement on a variety of cars for board track racing. They appear to be of natural rubber and have that coarse grained feel to them. Picking up the pace to a point where my neck was suffering I quickly settled in to some blistering laps, pushing harder and harder until I settled at an average of 7.6 secs for the 21.5 metre red lane and a fastest lap of 7.465. Next was the race prep. There isn’t much to be done with these unless you are changing the car spec so it’s a case of treat the braids (Voodoo juice), clean the tyres (silicone lube and dry off) and it’s off we go. The difference was immediate. The car takes off rapidly in a straight line instead of its initial sidestep. Cornering was 95% true, very little drift. Stepping beyond this was a deslot situation. The model just lifted itself once again. Blistering pace for such a small circuit but eventually it was the track which capped its overall pace! The back straight has a ‘Yump’ in it and it was here that the GT2 at flat chat would take off almost every time and not come down in the slot again. So the back straight had to be taken at a slight back off just to complete a lap. Woe of woes! Best time under these conditions was a lap average of 7.45 secs and a fastest lap of 7.120 sec. I am sure that without the hindrance the car would have been doing 6.8’s!! No matter. As it happens, this cars thoroughbred has already acquitted itself in the past. The group I was then racing with decided to introduce a three round Porsche cup trophy, all round being on wood tracks. I considered all the options and eventually decided the Pro Slot would be competitive. 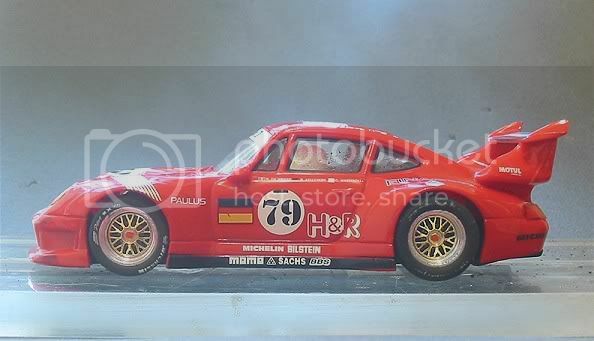 Scanning through the ebay entries one weekend showed up this model located in the UK. After doing the maths I put a good but not high late bid and sure enough it was mine. The model took some time to arrive and as the first round got closer and closer there was still no sign! As a precaution I prepared an old SCX Lois with a pro turbo but I knew it would be well off the pace even though it was handling well. The day before the race I came home to find the parcel had arrived and frantic body tuning action was taken. Luckily there was precious little to do! The next evening at the first round I got in a few hot laps practice and at the start of the event was off like a shot and was never caught! Leaving all in my wake including the latest Ninco Suspension models and Fly cars. Round two a few weeks later saw a couple of changes. Some of the racers turned up with Pro Slot GT1’s and 2’s !! Alarm bells rang a bit but the main thing was to stay cool. But it’s one thing to have a fast car and another to race it! Round two saw me take second place behind arch enemy and close friend Lindsay with his new Ninco 911. A couple of silly deslots and a fumbled marshall came home to roost. Round three on a very short and tortuous track saw, once again, a blistering pace and a head to head with Lindsay and myself. After a very close race with the lead changing several times I crossed the line first for race win and outright victory. Two points ahead of El Maestro! 21.500 rpm at 12 Volts. It is a pity the car was not designed for plastic as it has all the right features EXCEPT a good traction magnet. The plus is that there is enough room at the front of the motor to mount a bar magnet ‘a la’ Fly or Scalextric. An interesting project for a time in the future? So, I’m almost sure that there is still not a car in its class to match this on short circuit board tracks and in the right hands it would be invincible. I’m glad I dug this one up, as it now will accompany a box full of my favourite on my weekly social racing exploits.